The seminal sci-fi series Lost In Space, which aired between 1965 and 1968, was a cultural touchstone for children of the ’60s and ’70s. The series started with a serious premise: The Robinson family—father John, mother Maureen, daughters Judy and Penny, and son Will—along with Major Don West and their talking Robot, set out on a five-and-a-half year space flight to a planet near Alpha Centauri to seek out the possibility of human colonization there as Earth had become overpopulated and was being stripped of its resources. But when the nefarious Dr. Zachary Smith, who became an accidental stowaway, sabotaged their trip for an unnamed organization, they were set adrift in the cosmos, unsure of where they were or how to get back home. As the show progressed, particularly when it made the jump to color in its second season, episodes became more camp. Despite the outlandishness of some plots, the show endeared itself to millions of people for its portrayal of strong family bonds in the face of adversity and the witty banter between Dr. Smith and the Robot. In honor of Lost In Space’s 50th anniversary and its recent Blu-ray upgrade (and with rumors swirling about a possible reboot), we’re digging into the history of the iconic series. 1. THE ORIGINAL UNAIRED PILOT SET A DARKER TONE. IT ALSO COST $600,000. The original pilot “No Place To Hide”—which cost $600,000, or $4.5 million in today's dollars—was a more straight up sci-fi tale that did not include either Dr. Smith or the Robot in the cast. The Space Family Robinson saga—inspired by a comic book with that title from Gold Key Comics that began in 1962—started with their 1997 mission going awry thanks to a meteor shower, and the Jupiter 2 crash landing on a seemingly barren planet with harsh weather conditions and inhabited by dangerous cyclops giants. It was pretty impressive for the day and hinted at a more intense show than the one that ultimately aired. We still love the series, but this episode—unseen until early last decade—promised many more dramatic possibilities. 2. THE JUPITER 2 COST MORE THAN THE ENTERPRISE. The cost of the Robinson family's Jupiter 2 spacecraft was $350,000 ($2.6 million today), more than the Enterprise on Star Trek, which began airing when Lost In Space started its second season. Of course, a major difference is that the Jupiter 2 was a smaller ship, so we saw every chamber in it, whereas the Enterprise was a larger wessel (as Pavel Chekov would say) with many unseen nooks and crannies. It was all about scale. 3. LOST IN SPACE AND STAR TREK WERE COMPETITORS FOR TWO SEASONS. For the 1966-1967 and 1967-1968 television seasons, the two shows were primetime competitors. Lost In Space had an audience that skewed younger. Even though Star Trek has become an iconic franchise famed across the globe, spawning five live action shows and a dozen movies, the original series was not a major success and struggled during its three seasons on the air, although by the early '70s it had gained momentum in syndication. By contrast, Lost In Space—which had a 1973 animated series and a 2003 live action revival both killed off (although the former had its lone pilot air as part of The ABC Saturday Superstar Movie series)—allegedly ranked higher throughout its three-year run. Ultimately neither show broke the top 30 shows overall for any year that they aired. 4. JONATHAN HARRIS WAS THE MAIN PERSON RESPONSIBLE FOR CAMPING UP DR. SMITH (YOU BUBBLE-HEADED BOOBY). Partway through the first season, the producers were allegedly feeling lukewarm toward Dr. Smith’s antagonistic role and gave Harris license to play with his character. The actor then proceeded to gradually ramp up the camp and improvised many of his numerous insults directed at the Robot. As goofy as many of their exchanges were, Dr. Smith and the Robot’s Laurel and Hardy routine became a crowd pleaser. 5. BILL MUMY LATER BECAME INVOLVED WITH THE STAR TREK FRANCHISE. Despite being on a competing show, Mumy (who played young Will Robinson) always liked Star Trek and even lived down the street from William Shatner when both shows were on the air. Three decades later, in 1998, Mumy got the chance to play a human character on an episode of Star Trek: Deep Space Nine. Back in 1990, he co-wrote three Star Trek comic book issues published by DC Comics. Mumy’s sci-fi affiliations do not end there: He played Lennier for all five seasons of Babylon 5 in the 1990s. The Twilight Zone fans also know him as the child with godlike powers who terrorizes his family in the 1961 episode "It's A Good Life." He appeared in the 1983 movie's recreation of that episode as well. 6. 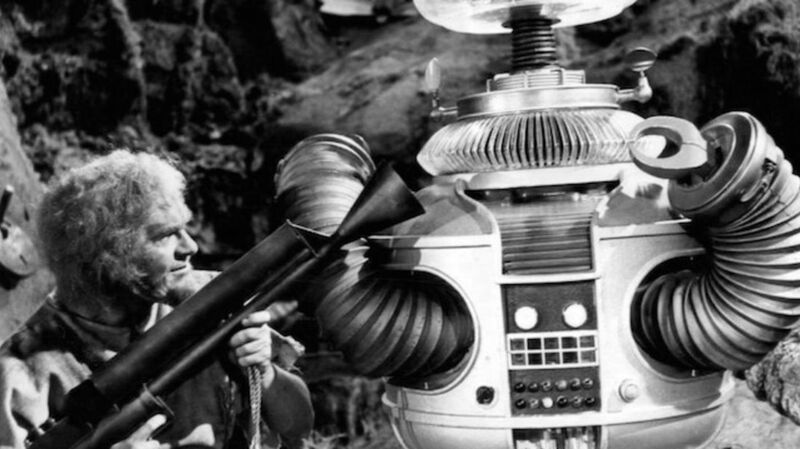 THE ROBOT AND ROBBY THE ROBOT ARE RELATED. If you noticed any similarities between the Robot on Lost In Space and Robby the Robot from the 1956 sci-fi classic Forbidden Planet, then you probably will not be surprised to learn that they were both designed by Robert Kinoshita. Indeed, Robby the Robot made a guest turn on the Lost In Space episodes "War of the Robots" (1966, as the Robotoid) and "Condemned of Space" (1967, as a robot prison guard). Kinoshita passed away last year at the age of 100. Evidently he was as durable as his creations. 7. GUY WILLIAMS RETIRED FROM ACTING AFTER LOST IN SPACE. The man who was famed for playing Zorro on TV between 1957 and 1961 and Dr. John Robinson from 1965 to 1968 decided to retire from the spotlight at the young age of 44 following the cancellation of Lost In Space. He later moved to Argentina, where he was reportedly beloved and where he lived until his death in 1989. 8. JOHN WILLIAMS COMPOSED THE MAIN THEME. TWICE. While he only contributed music to four of the series’ 83 episodes, famed movie composer John Williams (credited as Johnny Williams) did create the theme that was popular for the first two seasons, then created a more vibrant fanfare for the third and final season as the show focused on more outlandish scenarios. Interestingly, the unaired original pilot reused Bernard Herrmann’s music from the 1951 sci-fi classic The Day The Earth Stood Still, and nine episodes of the show reused Herrmann scores. La La Land Records recently issued a 12-CD set of music from the entire series. Part of the show’s charm did lay in its exciting, original soundtrack work, which featured many memorable themes from a variety of composers (some taken from other sources). 9. THE SHOW'S CREATOR IRWIN ALLEN WAS NOT A POSITIVE INFLUENCE ON SET. According to some cast members, Allen took things a little too seriously, and did not endear himself to people on the production. He had a reputation for being difficult to work with, even if many of his film and TV endeavors were highly successful. 10. THE TEPID MOVIE REMAKE ENDED TITANIC’S #1 STREAK AT THE BOX OFFICE. The critically panned 1998 movie remake, which was rightly derided for being too dark and lacking the warmth of the original, distinguished itself in two ways: It ended Titanic’s 15-week streak as the #1 movie in America. (Ultimately we know which film people remember best.) It also received a Golden Raspberry nomination for Worst Remake or Sequel. 11. JUNE LOCKHART WAS RECENTLY HONORED BY NASA. In the unaired Lost In Space pilot, we were told that Maureen Robinson had a PhD in biochemistry. When the pilot we all know aired, she was essentially the mother figure/supportive housewife for the show. Had her scientific knowledge been played up more, she could have figured more strongly into some of the plots. But nearly five decades later, in 2013, her alter ego, actress June Lockhart, became the third celebrity and only the first actress to receive NASA's Exceptional Public Achievement Award for "inspiring the public on space exploration." She called it "the highest honor of my life.” Perhaps the producers should have stuck with their original trajectory for Maureen.